Who can forget that over? Two runs to win, surely a nailed-on certainty? Even an edge, a miscue or a mis-field would be enough. That was the situation Armitage Bridge were faced with against Golcar in 1970 as Brian Turner took off his cap and strode back to the end of his mark. He needed to bowl six balls on the money and hope his fielders were on their toes. A single was collected, now only one to win with three wickets in hand. Surely one of three batsmen could nudge a single somewhere? Dot balls were needed, wickets would be even better and Turner delivered. The batsmen strolled back one after another and one thing stayed the same - the score. It remained 159. Golcar had somehow got out of jail. Brian Turner always looked for wickets, no matter what the situation of the game was. He was relentless. His philosophy of attack was highlighted superbly in the match against Lascelles Hall, a game that Golcar veteran David Thorpe remembers well. “They needed six to win off the last ball and in that situation most bowlers would try and bowl it as wide as possible or at leg stump, but Brian tried to take a wicket and that was his attitude - he wanted to take a wicket off every ball; in the end the lad hit a six and we lost that game”. Observers would agree that Turner was a master of swing, with the inswinger being his stock delivery. He was a very intelligent bowler who cannily varied his pace so that he could swing the ball late depending on the overhead conditions and the state of the pitch. He could also readjust his action to bowl away swing. The batsman always had to watch the ball right onto the maker’s name; there was also the occasional leg-cutter to look out for. Turner was born into cricket. His father Cyril played county cricket for Yorkshire from 1925 to 1946, amassing 6,132 runs and 173 wickets in 201 first-class matches either side of the Second World War. As well as playing he also coached at Bramall Lane in Sheffield, on behalf of Yorkshire CCC, overseeing the development of many future stars. The most notable of these was Freddie Trueman, who went on to become a legendary Yorkshire and England fast bowler. It was during this time that Brian Turner took his first steps into cricket. “My father took me to the nets at Bramall Lane when I was 8 so I had the benefit of professional coaching from then on”. It didn’t take him long to impress and by the age of 15 he was a regular in the Sheffield United first team. Turner enjoyed 15 prolific seasons at the club from then on, becoming the club professional in 1960. Honours and wickets continued to flood his way in the early 1960s; he picked up the league bowling award in 1962, taking his wickets at an incredible 6.85 apiece, a record mark that stood for over 30 years. Turner’s performances in the late 1950s and early 1960s, including eight-wicket hauls in three consecutive weeks, earned him a call-up to the Yorkshire county side and he made his debut for the White Rose against the touring South African side in 1960. He made one more appearance the next season against Gloucestershire and the fact that his career record produced figures of 4 for 47 says that he was unlucky not to have played more times, but there were reasons for this. “I had success but I was unable to pursue a career in professional cricket because I couldn’t get the necessary release from work to be able to play on a regular basis, which was the biggest regret of my career”. Despite the frustration of a brief county stint, Turner was still able to mix it with the best during his career. “I have played with many great players. Gary Sobers was my choice for best all-rounder, Fred Trueman as best bowler and Tom Graveney as the best batsman. Sir Leonard Hutton was my cricketing hero”. After his short but successful spell at Yorkshire he returned to Sheffield United, where he continued taking wickets until 1967. It was then that Golcar came calling: “Sheffield United Football Club took over the Bramall Lane ground in 1967 and the cricket club was in a state of flux. It was at that time that Golcar CC approached me to be the club’s professional. From then on I had 14 happy seasons at Golcar; everybody at the club treated me well and the memories I have will always remain with me”. Turner’s impact at Golcar was virtually instantaneous, just as it had been at most of the clubs he had played for throughout his career. 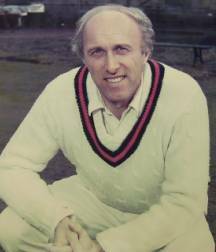 He was a serial wicket-taker at Swallow Lane claiming the Huddersfield League bowling prize on several occasions; in the process he collected the Huddersfield Examiner £50 prize for the first bowler to reach 50 wickets in a season on numerous occasions. Over the course of his career he picked up an average of five wickets a match, an incredible strike-rate which was the product of his stamina as much as his ability. He would often bowl unchanged throughout the course of an innings. He was a captain’s dream. The man who had the pleasure of captaining him for most of his spell at Golcar was John Cooper and he held Turner in high regard. “He was a very accurate bowler who you could rely on to bowl long spells, 20-odd overs a game. The other thing about him was his loyalty. He could have left the club on several occasions and picked up more money elsewhere but he stayed loyal to the club”. Brian Turner retired from cricket in 1982 and his departure left a massive hole to fill in the Lilies’ line-up. His 14 seasons at Golcar brought him over 1,200 wickets in the Huddersfield League and he dominates the list of bowlers (on the club’s website) who have taken seven-wicket hauls for Golcar. Bowling was certainly what he will be remembered for but he was a very capable all-round cricketer. He opened the batting for Sheffield United and scored a century. He was also a reliable slip fielder, which is something that is quite unusual for a fast bowler, but he was a cricketer who always enjoyed a challenge. “My philosophy is that all sport, particularly cricket, is healthy and character-building”. In April 2005 Turner was invited back to Swallow Lane to unveil the club’s new scorebox and changing facilities. “I was very touched to be asked to do it, especially seeing as it was 24 years after I finished playing. I enjoy coming back to Golcar whenever I can; I consider it to be a second home”. In recent years he has enjoyed coaching and passing on advice to his young grandson, William, who has recently been chosen to receive professional coaching from Yorkshire. Maybe we will see the name Turner on the Golcar teamsheet once again, or maybe we will even see a Turner playing regularly at Headingley and realising his Grandad’s dream!